Founded in 2003, Seasons 52 is a restaurant chain operated by Darden Restaurants. 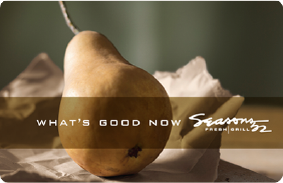 Seasons 52 has 43 locations nationwide where it offers fresh grill cuisine in a sophisticated environment. Sell Seasons 52 gift cards on Cardpool.